Happy Thursday! I hope that everyone's summer is going well, mine has been hot, humid and busy, but I am not complaining. I recently finished my first interior design class at Parsons and it was intense but fun. I took a basic drafting class to get my feet wet and to be honest, I had no idea what to expect, but more to come on that in another post. Today's post is all about beauty! So if you are anything like me, you might have a ton of products that you believe, you must have lol. 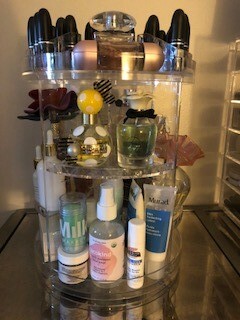 However, keeping those beauty products organized can be hard, so check out my guide below for some tips and recommendations on how to do just that. Ok, this is a pretty simple guide on how to organize beauty products. 2. Next, I gather the products that I use frequently, but perhaps not everyday. These include things like my favorite perfumes, lip colors, body sprays and oils. 3. Then, I look for any new or old products that I want to try or use again. 4. Finally, I look for an organizing solution that's easy to access and can contain different types and sizes of bottles and jars. This is the fun part! There are so many organizers on the market that it can be overwhelming, but remember, this is simply to store the products that you want access to almost everyday in one place. So after searching around, I came across this acrylic organizer on Amazon. You can find it here for $25.99! Check out the picture below of how I have mine organized and let me know in the comments what you think! Also be sure to follow me on IG @cosmopolitanclosets - I upload pics frequently of my organizing and accessorizing adventures. As always, thanks for reading! This side holds all my essentials in the bottom compartment - toner, moisturizer, deodorant, etc. I use these everyday, so I wanted them to be in close reach. The beauty of this organizer is that you can change the shelves to be at any height depending on the products you want to store. This keeps the products from being spread all over the dresser and bathroom. 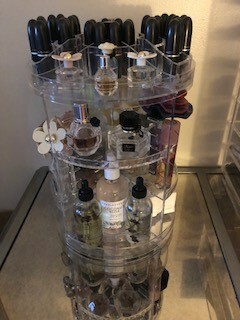 This side holds my more frequently used products, such as the perfumes and the oils at the bottom. These oils are great for when my skin feels tight and dry, but I don't use them everyday. The face mist is a recent purchase that I wanted to keep out so I can make sure I try it. 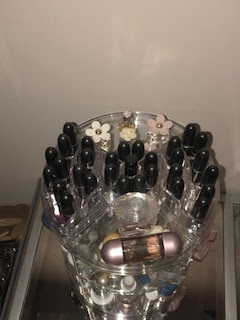 This is the top of the organizer, which holds all of my MAC lipsticks. The lipstick organizer piece is removable, which is nice, in case you want to put something else there instead. Taking these lipsticks out of the drawer helps me realize I don't need more of them and to try the colors I haven't worn in awhile. 1. I love this one here for $21! It comes in different colors and is a little glam. 2. I did a product review on a similar organizer that can be found here. 3. Here is a slightly different version of the one I have and it comes in black and white.